You can also record instruments with it (I have used it to record a guitar with a 4x12 cab, snare drums and hi-hats), but you shouldn't expect to much from it because it isn't meant for that! I've had it for eight years now, and haven't had a single issue. Give it a try, it only costs $40 and the result is not bad at all. You are still here?? Go get it now!! I've had this mics for several years. Considering their price, the natural prejudice is to think they are crap. When I used a "real" mic (Neumann KMS105) that costs $650 and gets accolades from everyone here, I was surprised (stunned) to realize that the poor Berhinger that costs $15 a piece can stand up and is even better than the Neumann. I am not a pro nor an engineer, but my ears tell me that these Behringer are awesome and their value for money is jaw-dropping. I haven't been able to check whether it creates feedback on stage. What did I learn from this? I'll pass on the Neumann and take "precious" care of my Behringer. Use for 3 years not for the song (I have no opinion on this point, merely the studio with static) but for the resumption of toms, I needed an emergency three microphones for Cheap a little session before investing in "better." Premire remark, excellent output suprieur a sm57. Sound: I or ears or dglingues is a trick. Toms with dynamic sound and natural harmonics are the chopper Submitted beautiful and well (I love when a "rsons" Fawn mastery, I dtest sound "poc ") Feelings General for neutrality. Trs relevant toms on 10 14 '. From 16 ', go on plutt ddi bassdrum microphone (kick drum mic or static). Multiple records effectus. Amme a drummer's position E604 in his "box" of a cot XM1800S. The SM57 is a drag on high The definition of the medium but dropped the case on the bottom mdium and serious. It's really impressive in terms of price. If so, try and see (with good Obviously pramplis). Conclusion? I gave up buying other microphones toms, as j'apprcie their sound. Purchased 30 Euros with three claws and the briefcase, they are unbeatable 10 euros per pice. I use these mics for the sound of my acoustic drums (while waiting for better), I will test soon to singing and guitar amp. A Premire view, the microphones seem solid, quite heavy, we see that it's not toys. For the drums, the sound is not bad, I used one for the bass drum and 2 overhead which take the rest. What I can say is that the overall sound is okay plutt rglages After a few hours. In particular the sound of TOMS and the Snare, which is simply amazing! I can not believe, attack the CC ets much banging and the sound of the toms are reproduced perfectly! 10 microphones for the unit is just crazy! In contrast to the bass drum and cymbals is worse, but hey, it was worth the money. So I think later use these only three microphones for my 3 toms seen that the rendering is excellent, and purchase additional microphones for the rest. Micro ddi singing, animation (seminars, karaoke. Directivity super-cardioid to avoid transplanting the sounds coming from the rear. An on / off switch on the body. Body metal. Plastic clip with thread but mtal rducteur seemed fragile plastic (note the thread). Purchased in hard case 3 to 39 port included. I use them for less than a week but it is enough to realize that the case is excellent! I have compared my M-Audio Solaris (micro studio), the singer of my SM58 and PG58 we used the animation. At this price, one would expect of toys ... it is nothing. 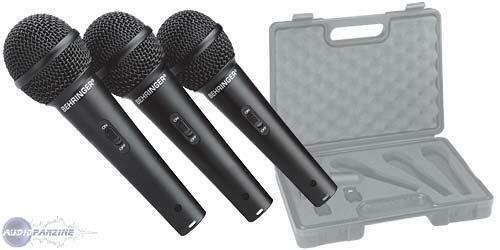 These microphones are generally neutral with a lightweight bass boost makes everything enjoyable. Their dynamic is impressive for a product of this price. Not quite an SM58 but better than the PG48 and 58 costing four times as much! Utiliss to dub the choirs, or as a vocal microphone booster is frankly well. Before a guitar amp, it's okay too trs. XM1800S These are not too sensitive to feedback and being protected properly against the "plops". I will not speculate on their three or four APRS Resistors falls on the floor but ... In fact it is the type of micro "do everything" the essential range of amateur band but srieux. A 13 euro pice, no reason to deprive yourself. I regret not even have bought before. Cardioid dynamic microphone for voice. On / Off switch. Carrying case. They are hardy and worth the entry level Shure. I use them for a week with karaoke and for the price, I do not open. It is largely enough to use as I did (or rather that its use by clients if you know what I mean ...). Microphone for sound recording and singing. At first, I'd buy it because I had a microphone and my old band had two singers. Doing a little animation in my spare time, I thought it would be a worthwhile investment. Well I'm definitely not disappointed! These pickups are perfect for their prices, the sounds are clear, even if there is a slight tendency to refer more serious but at the price (10 euros one or less with the clip and carrying case) we will not complain ! So very good choice if you are not wealthy or you want to equip a studio to rehearse. They are primarily dynamic mics for vocals. 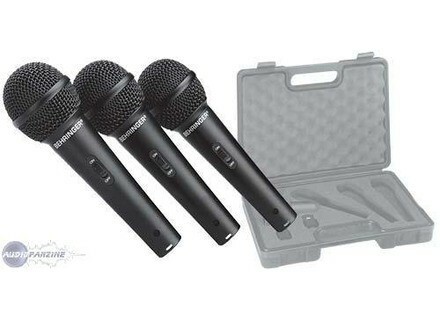 I use them for several months and I must say I am very impressed because my group and did not have many months budjet for microphones and it was believed that these microphones gave her a not so good but we were very surprised because the sound is very clear voice is really impressive. Of course it's not as though a sm58 but it holds the road well! + What I like is obviously the price for the sound quality is very good value for money, there's nothing unpleasant about these mics, I advise those looking for a good sound for a price not high (especially that there are 3 clips and carrying case). These pickups are incredible, I use them for a week by repeating, there are two singers, both with the micro and the quality is really good, pay for 30 ca ... there's no photo. Report excelllent quality prices, I'm also confirm what I say prdescesseur, it does not hand toy tt it seems to have a real microphone. In addition to the kit as a bonus ... what more. Micro chant basic dynamic and cardio. switch. Ben is doing very well the job. Same kind as the XM8500 (I too), I was fine to be very careful record and all, are very similar. The only diffrence: a greater propensity to give the feedback, its a very very very slightly more stock (but they must hear the voice only to realize it) and look much less "pro". M'enfin is still a matter completely unbeatable: three micro valid in a suitcase for 30 ... the ideal solution for choirs or RPET. It is solid.